Robmar Precision Machining offers cutting-edge machinery to offer top-quality milling and other services making us the best in this industry. Robmar Precision is excited to announce the newest addition to our machine shop. Installation and training on our brand new HAAS UMC 750SS 5 AXIS MACHINE was complete as of June 1, 2017. At the close of March, Robmar Precision provided a 4 day in-house training course led by a PC-DMIS Trainer for our shop and inspection employees. This training was for the new software that was recently installed on our upgraded C.M.M.’s. Education for our employees on the equipment and machinery, here at Robmar, is an integral part to the overall commitment to continuously make improvements in order to provide greater customer satisfaction. In order to keep our personal commitment to Robmar’s continual improvement, we have made some updates to our buildings. New bright LED lighting has been installed throughout the entire work shop to form a brighter work environment for our employees. The interior and exterior of our machine shops have been freshly painted to perk up our buildings appearance. As we continue to make improvements here at Robmar, we will keep you informed by posting here on our website as well as on our LinkedIn page. Check back periodically to see what’s new. Robmar would like to present our 2016 On Time Delivery and Quality matrix. Robmar Precision announces 2016 re-registration for ITAR Code# M21596 exp. 10/31/2017. Robmar Precision is proud to announce that we have passed our yearly audit for AS9100C with no findings. 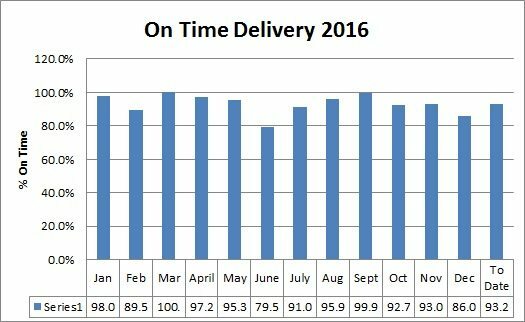 Robmar would like to present our 2015 On Time Delivery and Quality matrix. Announcing Robmar’s re-registration for ITAR Code# M21596 exp. 10/31/2016. Robmar is pleased to announce the replacement of an older SNK CNC Lathe with the purchase and installation of a new Hardinge GS-51 CNC lathe with live milling, sub-spindle and LNS bar feeder. Robmar is pleased to announce the purchase and installation of 2 new HAAS vertical machining centers. 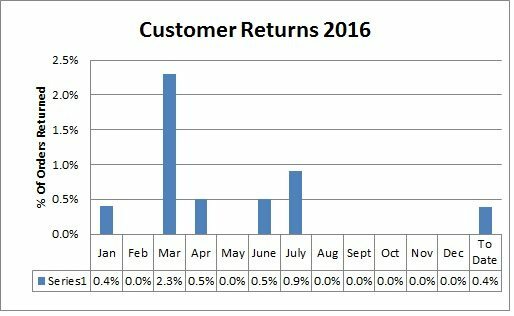 1 VF-1 and 1 VF-4 increasing our internal capacity thus shortening our lead times to customers. Robmar Precision passes yearly audit for AS9100C with no findings. Robmar has seen a need for more capacity and newer technology. We are pleased to announce the purchase and install of 2 new HAAS vertical machining centers. 1 VF-1 and 1 VF-3 replacing 1 older Fadal CNC mill. Robmar is announcing the purchase and installation of 1 new HAAS VF-6/40 Vertical machining center. Increasing our internal capacity. Robmar is pleased to announce the purchase and opening of Plant 2 a fully air-conditioned facility for shipping/receiving and prep department. Thus opening space for future growth and capacity in both facilities. 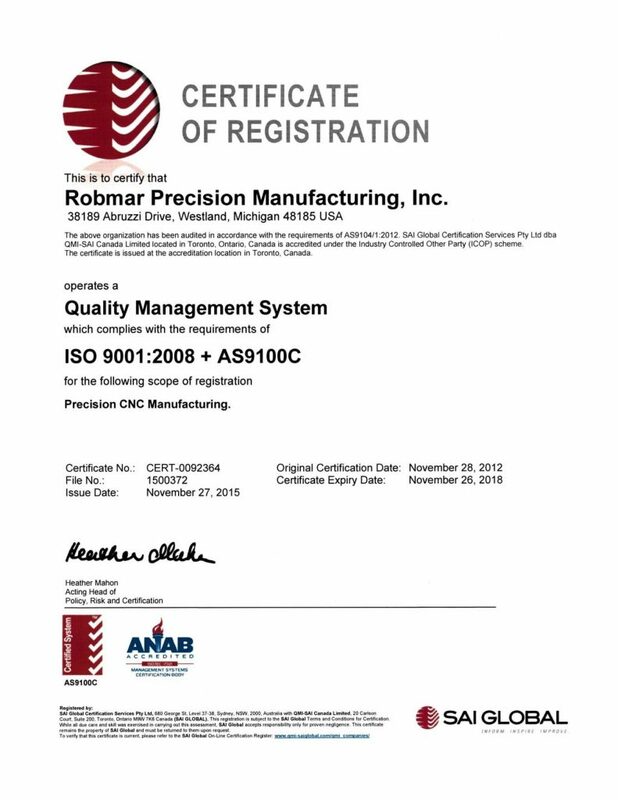 Robmar Precision is pleased to announce they have received ISO 9001:2008/AS9100C certification. Thus making them a certified Aerospace Manufacturer of quality CNC Machined Parts. Upgrading from ISO9001:2008 at request of our customers.